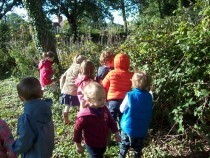 The Autumn Term was filled with blackberries and apples. 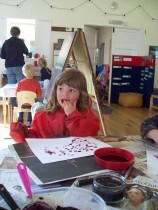 We made crumbles, apple prints and our own blackberry juice paint, which Beatrice discovered was very tasty too! We tasted and learnt to identify popular types of apples and studied the life-cycle of an apple tree. On 19th October an inspector from Ofsted arrived to carry out our re-inspection. She spent the whole day with us and at the end we were relieved and delighted when she pronounced us “Outstanding” in all areas! 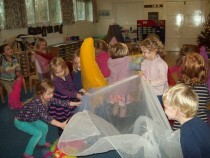 In November we enjoyed making rocket pictures and dancing to firework music during our weekly lessons with Annaliese. 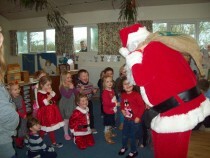 We celebrated Christmas with the children by learning and practising lots of traditional party games. At our Christmas party we played our favourite ones and enjoyed a delicious lunch provided by parents. To the children’s surprise and delight, Santa dropped in, despite the lack of snow, and delivered each child an early Christmas present. 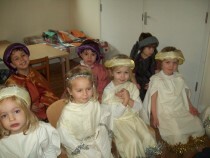 Our Nativity on the last day of term was enjoyed by all of us, including parents and grandparents. 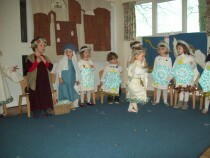 The children sang and danced to some very catchy tunes and Emilia was superb as our very own “whoops-a-daisy” angel.